(NBD.com.cn) Amidst the disaster, rumors spread with the winds. May 17, 2008. As the saying goes, three's a crowd. Rumors can be produced and distributed through any number of ways. There are thousands of "reasons" why people might believe them. But if the government can disclose the truth on a timely basis, the rumors will be dispelled. On May 13, Chengdu city had basically returned to normalcy. Traffic on the roads flowed easily. Telephone calls could be connected. The terror felt on May 12 seems to have gradually dissipated. People exchange knowledge about earthquakes, and information about aftershocks was distributed. Many people did not know where the information came from but they would rather believe it than be sorry later on. Some people stayed in open spaces and spent their time chatting, playing cards, sleeping and otherwise doing nothing. Yet, this new calm was quickly disrupted. On early morning of May 14, the Pixian county government received warning reports from Ande, Tangchang, Huayuan, You'ai, Hongguang, Tuanjie and other towns. These towns are on Route 1 leading from the heavily devastated Dujiangyan to Pixian. According to the warning reports, a group of as many as 10,000 disaster victims were rushing in the direction of Pixian. Most of these people wore surgical masks and also wrapped themselves in blankets. "The chemical plant has exploded," "toxic gas has escaped" ... the rumors were quickly spread from mouth to mouth. As the crowd moved down the road, more people joined in. The size of the crowd swelled. Previous to this, a rubber factory in Puyang town, Dujiangyan city caught fire. The local residents smelled an unpleasant odor. Given the nervousness of the people after an earthquake, this simple fire was turned into a major pollution event at a chemical plant. People started to flee for their lives. Thus, the fear of a small number of people became a mass exodus. Once the facts were known, the Pixian county party secretary and the mayor led up to a thousand cadres onto the streets to publicize to the people. The people then calmed down. By 9am, the refugees began to disperse slowly. But the "chemical factory explosion" rumor would now surface in another version more than 10 kilometers away in Chengdu. Dujiangyan and Pixian are located to the northwest of Chengdu, which draws its drinking water from the Baitiao River that flows down from Dujiangyan through Pixian to Chengdu. "Chemical plant explodes in Dujiangyan and the water source is contaminated: no more water in Chengdu!" At just past 9am on the morning of May 14, the rumor at Pxian had been dispelled but it surfaced in a mutated form over in Chengdu. At the time, many Chengdu citizens did not pay attention. But the actions of other people affected their judgment. On the streets, many people rushed to purchase water. Between 10am and 11:30am, more than 4,000 people entered the Haoduo supermarket on the Southern Third Section of the First Ring Road. Their sole purpose was to buy cases and cases of beverage. 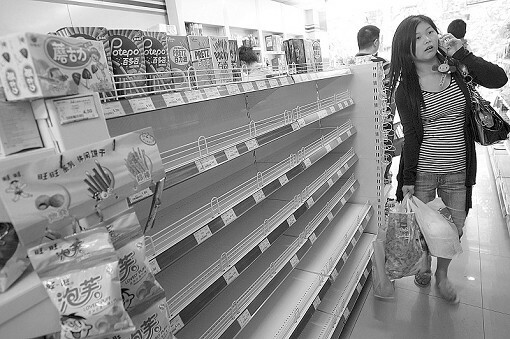 In less than two hours, the 3,000 cases of beverages at this supermarket were sold out. The buying spree was repeated at other supermarkets, chain stores and concessionary stores. It got more and more heated as long lines were formed at the supermarkets. Someone stood on line from just past 10am and did not get out until 2pm. At around 11:30am, it was almost madness. People on the street were either hauling water back home or else rushing to buy water. The people naturally tied this with the rumor about the chemical plant. Some people rushed out to buy water, but most of them found out that there was no longer any water for sale. Then some residents began to store tap water. They used pots, cans, bottles, washing machines and any possible containers. But people found that the water was only trickling in. This detail seemed to confirm the rumor. Later on, people realized that this was because the water pressure was reduced due to too many people running the water at the same time. By noon, there was basically no mineral water available in the city center of Chengdu. Someone drove form the First Ring Road to the Second Ring Road to the Third Ring Road and still ended up with nothing. This "water seizing" campaign was joined in not only by individual citizens, but certain companies and enterprise units also joined in a "systematic" way. This development made the Chengdu city government realize that they must dispel the rumor officially. At 2:30pm, the Chengdu city government secretary-general Mao Zixiong spoke publicly to the media. The Environmental Protection department told the citizenry that its monitoring data showed that there is nothing abnormal about the drinking water. At 2:48pm on the afternoon of May 14, many citizens received SMS messages from the Chengdu city earthquake disaster command center to the effect that there have been no incidents of toxic leakages or explosions in Chengdu and surrounding areas and that the water supply is adequate, safe and normal. The message also said the public security bureau will also investigate the source of the rumor and punish the perpetrator. At noon, the drinking water supply returned to normalcy and the water-buying spree and rumors about the explosion at the chemical plant died down. On that day, the Chengdu city government issued public notices number four and five to ask the citizens to refer to television, radio, newspaper and other formal channels as the source for correct information, to ignore the rumors, to work with the earthquake relief effort and to maintain a normal life. The Chengdu public security bureau announced that they have arrested three netizens who spread the rumors and that these people will be punished accordingly. Even as the Chengdu citizens were engaged in panic buying of water, another rumor began to spread widely on May 14. This rumor was no less powerful than the one about water shortage. The Zipingpu reservoir is located upstream of Dujiangyan with a planned capactiy of 1.12 billion square meters. If there is a problem with the dam, it is over for Dujiangyan. Someone was spreading the rumor that "the Zipingpu reservoir dam was severely damaged during the earthquake and about to collapse soon." According to eyewitnesses, the water level of the reservoir began to rise sharply during the earthquake. Once the information piled on itself, many Dujiangyan residents began to believe it and moved their families away. Suddenly, the middle-class and lower-class hostels in Chengdu were fully booked. The people were worried and so was the government. Before this rumor became widespread, the Water Works Department deputy director Qiao Yong had led a team of experts to Zipingpu on May 14th. The experts made a thorough examination of the Zipingpu dam and did a scientific evaluation of the data. Their conclusion was that the dam was structurally sound and stable. Very quickly, the media arrived at the dam. There, they learned that the reservoir carried only 300 billion square meters of water, which was less than 30% of full capacity. The reporters found out that there were some cracks at the top of the dam, but it was safe overall. According to Zipingpu Development Company general manager Li Hong, the dam was designed to withstand an earthquake stronger than magnitude 7.8. Afterwards, the rumor about the dam died gradually. At 6:05pm on May 13, many people received a SMS message from the Sichuan Provincial Earthquake Bureau: "The claims that 'there will be an even stronger earthquake this afternoon' and 'a magnitude X earthquake will occur at date X at time Y' are false. Please do not believe in these rumors." Yet, the rumors about the aftershocks did not stop. By May 14, they were being spread in the form of "There will be a strong earthquake in district X of Chengdu" and other variations. Some of these were based upon unusual animal movements. Although the government and the experts all said that the aftershocks would not be destructive and that people can go home to sleep, many people either fled the city or slept in the streets during those two days. At 11:30am on May 15, the businessman Wu Fengjun of the Chengdu Southwestern Food City received a call from a stranger who said that there will be a magnitude 7 earthquake in Chengdu. Wu asked the media for confirmation. The reporter immediately began an investigation. The caller was a middle school teacher named Li. He wanted to tell his mother to flee from the earthquake, but he dialled the wrong number. Fifteen minutes ago, teacher Li was reviewing papers with his colleagues at the office. Suddenly, the division director named Liu rushed in and said that he had just received notice from the school leader that there will be a magnitude 7 earthquake immediately and therefore they must evacuate the school. The decision had been based upon information from chemistry teacher Mr. Xiong. Teacher Xiong said that he was speaking at 11am to his daughter who worked at a bank. She told him that there could be some strong aftershocks and the bank employees have left the building. He thought that the bank was a major entity and thus the information was reliable. So he immediately told the division director. "I only said that the aftershocks would be strong. I have no idea how it was turned into a magnitude 7 earthquake." The daughter of teacher Xiong called him after receiving the evacuation order from the security department. The bank got its information from an employee who had a relative working at the Earthquake Bureau. From one person to the next, a relatively strong aftershock became a magnitude 7 earthquake in less than one hour.